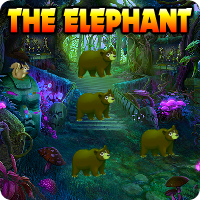 AvmGames - Avm Escape The Elephant is another point and click escape game developed by Avm Games. This summer you went to volunteer at a wild animal reservation in Africa. This was your dream forever, to stay there and help those wild animals. When you got there you realized that is a really hard job, but is worth the satisfaction which you get. Today there is a situation. One of the elephants have disappeared. For sure it ran away to the forest and it's your job to find it and rescue it. So explore the forest, find the lost elephant and rescue it from the forest. Good luck and have fun! 4x4 grid: buttons the line in paper clue does not cross. that paper is also for the grid alpha. What does your comment about the buttons mean Daz? Oh I see, there are only three stars to press. And they have to be from the topmost one to the bottom in order. where to use the word varnish? no brush needed, paint color is clue. no more such PITA sliders!